Distinctly striped in black-and white plumage with a slightly decurved bill for bark foraging, the Black-and-white Warbler moves vertically along tree trunks, exhibiting characteristics generally attributed to nuthatches. The adult body length ranges from 11 to 13 cm, with an average wingspan of 21 cm. Body mass ranges from 8.8 to 15.2 grams, and bill length from 10.0 to 13.7 mm. The female is the smaller of the two sexes. Males, exhibiting darker, more contrasted markings than females in both breeding and non-breeding plumages, are defined by conspicuous black and white coloration. In breeding plumage, the male crown has a broad white median stripe, black sides, and a broad white superciliary stripe that extends to the nape. The lores and ear coverts are black, while the submustachial stripe is white above a black throat with black and white streaked sides of the neck. A white eye-ring contrasts with black ear coverts. The upper and underparts are streaked with black and white, the underparts being the more distinct and boldly marked. The wings are black with two evident wing bars. The feathers of this warbler's truncate tail are dull black marked with white, revealing white tail spots. The female's breeding plumage is similar to the males, but with pale gray lores and ear coverts and less contrasting black and white markings overall. A narrow, black eye stripe, white throat, and a less defined streaking on the back also distinguish the female from the male. Additionally, the female's tail spots are less distinct and a faint buff wash on the flanks and sides of the throat is generally present (Kricher 1995). The eyes have a brown iris. The feet in the juveniles are a pinkish-buff, becoming darker to black with age. The vocalization of the Black-and-white Warbler is described as a thin, high-pitched two syllable squeaky "weesee, weesee, weesee," or "squeaky, squeaky, squeaky," repeated upwards of ten times (Kricher 1995). One of the highest pitched of the wood warblers, the song of the Black-and-white Warbler is described as resembling the sound of a wet rag wiped repeatedly across glass (Bent 1953, Kricher 1995). During breeding, a variation of the primary song is of a longer, faster, and more varied pitch (Bent 1953). Although varied, the call note of this species can be described as a sharp "chip," "pit," or sharp rattling "stick" (Terres 1980, Sibley 2000). The Black-and-white Warbler is distinguished from similar warbler species by its distinctive black and white plumage and its nuthatch-like foraging behavior. Few other wood warblers forage in this manner, and those that do are not black and white in coloration. The two other black and white warblers in Montana, the Blackpoll Warbler and the Black-throated Gray Warbler, are noticeably different in plumage. The Blackpoll Warbler has an un-striped black crown and white cheek and throat, while the Black-throated Gray Warbler has a bright yellow spot in front of each eye, a solid black (or black and gray) un-striped head, and a mostly gray, un-striped back (Kricher 1995, Sibley 2000). Neither of these two species possess a decurved bill (Sibley 2000). Less dependent upon flying insects, the Black-and-white Warbler generally arrives earlier in the spring and stays later in the fall than other warbler species (Johnsgard 1986). 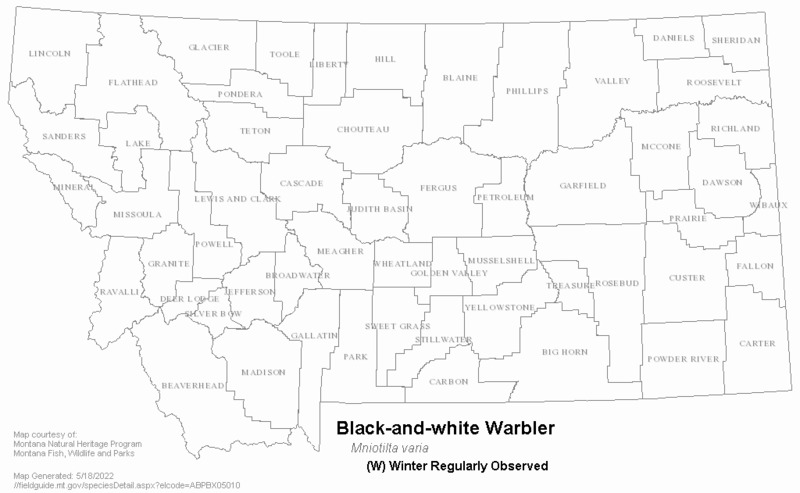 Birds have been recorded in Montana and southern Alberta from early May through early September. 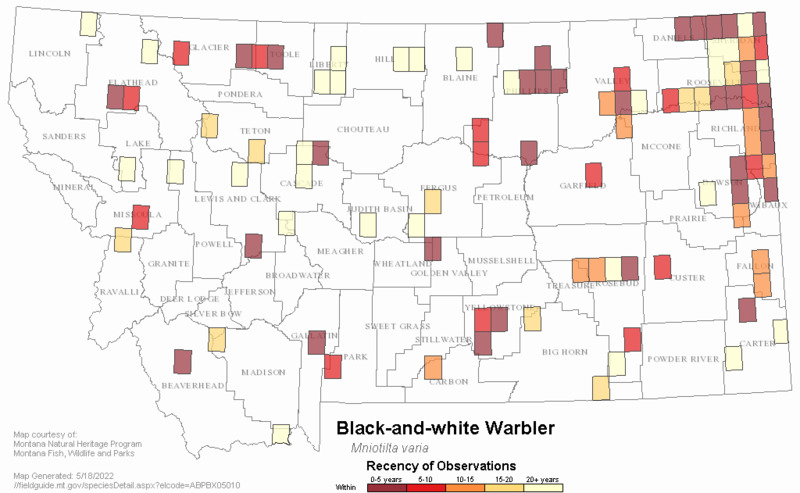 May is the earliest month recorded for Black-and-white Warbler observations in Montana. The majority of the latest season records are for August, although one record just south of Ninepipe National Wildlife Refuge indicates an individual present in October (Montana Bird Distribution Committee 2012). Information on habitat use in Montana is limited. Existing records indicate observations in riparian habitat and woody draws, those of mixed deciduous and ponderosa pine (Pinus ponderosa), in the eastern part if the state (Skaar unpublished data). One observation record indicates a female feeding on Douglas-fir (Pseudotsuga menziesii) northeast of Helena, while numerous records exist for the deciduous habitat in the town park in Westby, as well as that of several backyards, specifically in the northeast portion of the state (Montana Bird Distribution Committee 2012). In general, the Black-and-white Warbler inhabits young, medium-aged and mature deciduous and mixed forests during the breeding season (Bushman and Therres 1988, Kricher 1995). Studies of habitat selection have yielded conflicting results that appear to be due to geography, as well as variations in forest type and stand age. In the southern part of its range, this species appears to be most closely associated with relatively closed-canopied forests with low shrub density (Conner et al. 1983, Crawford et al. 1981, Noon et al. 1980, Wilson et al. 1995). 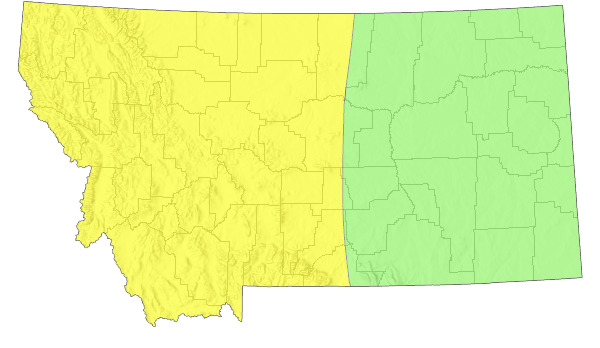 In aspen forests in Alberta, however, stands with high shrub density were avoided (Westworth and Telfer 1993). Black-and-white Warblers were associated with high tree density and high canopy volume (indicative of mid- to late-successional forests) in mixed forests of central Ontario (Clark et al. 1983). The Black-and-white Warbler typically nests on the ground, often adjacent to a tree, shrub, rock, stump or log, under a shrub or dead branches, or, more rarely, atop stumps (Bent 1953, Kricher 1995). A wide variety of habitats are used during the non-breeding season, from early successional disturbed areas to mature forests (Kricher 1995). Caribbean habitats utilized include coastal forest, dry interior forest, wet forest, forest edge, pine woods, riparian areas, wetlands, urban habitats that provide plant cover, and some open areas (Arendt 1992). Cacao, citrus, mango, shade coffee, and pine plantations in Puerto Rico, Jamaica, and Costa Rica are also selected (Robbins et al. 1992). Even though it showed a preference for undisturbed habitats, particularly forest, this species is considered a habitat generalist in western Mexico (Hutto 1992). Primary forest is preferred to other habitat types in the Yucatan Peninsula, Mexico (Greenberg 1992, Lynch 1989) and in Veracruz, Mexico (Rappole et al. 1992). In the Virgin Islands, they exhibited a preference for moist forest (90.5% of detections) over other habitat types (Askins et al. 1992). Foraging principally by creeping along tree trunk and branches, Black-and-white Warblers also foliage glean (Bent 1953, Kricher 1995). The main food items are chiefly insects, including beetles (Coleoptera), caterpillars and moths (Lepidoptera), ants and other Hymenoptera, flies (Diptera), and bugs (Hemiptera), and may include spiders (Arachnida) and harvestmen (Phalangida) (Bent 1953). Lepidopteran larvae are important prey during spring migration (Graber and Graber 1983). The remains of a small lizard were found in the stomach of one Texas specimen, indicating further variety in their diet (Oberholser 1974). Little information exists for this species in Montana. In quaking aspen (Populus tremuloides) forest in Alberta, male pairing success was lower in forest fragments (56%) than in continuous forest (80%) but due to small sample sizes, the difference was not statistically significant (Sodhi and Paszkowski 1997). The Black-and-white Warbler occurs commonly in small, mixed species flocks of warblers in the Virgin Islands in winter where density in moist forest was less than 1 per hectare on St. Thomas and 1 to 2 per hectare on St. John (Ewert and Askins 1991). Conflicting reports of winter territoriality exist (Faaborg and Arendt 1984, Morton 1980). Site fidelity is exhibited on the wintering grounds in Puerto Rico where 22% of banded birds were recaptured at the study site. The average time between banding and recapture was 1.9 years; the longest interval was 4 years (Faaborg and Arendt 1984). Twenty percent of birds captured in Cuba were birds banded there the previous year (Gonzalez-Alonso et al. 1992). The average annual adult survivorship is estimated to be 71%, with the oldest known individual aged at 11 years, 3 months old (Klimkiewicz et al. 1983, Kricher 1995). Known parasites on Black-and-white Warblers include blood parasites (Haemoproteus spp. and Leucocytozoon spp. ), feather mites, a louse species (Myrsidea incerta), and one fly species (Ornithoica confluens) (Bent 1953, Kricher 1995). Bent (1953) indicates maggots destroyed a nestful of young. 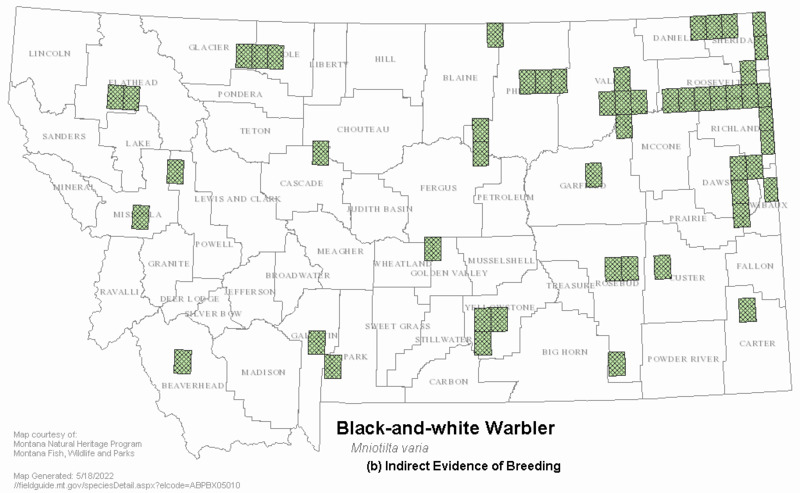 One record of direct evidence of breeding was recorded in Valley County, but details of the nesting event appear lost (Skaar unpublished data, Montana Bird Distribution Committee 2012). 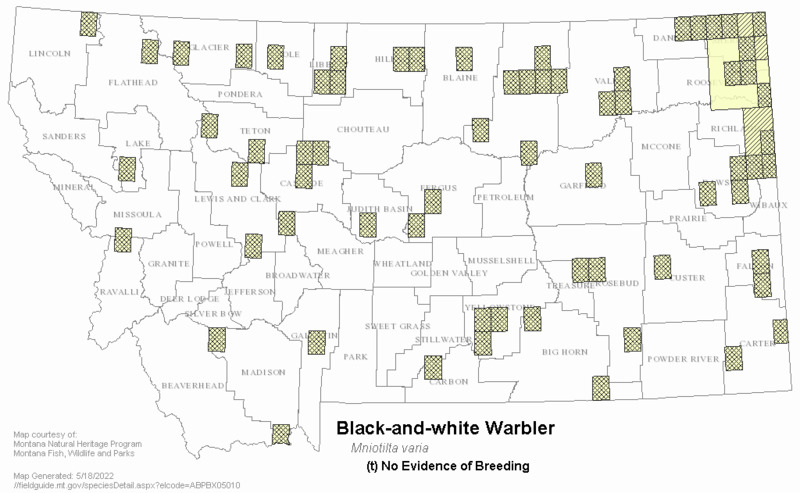 Additional observations that indicate behavior suggesting breeding have been recorded in Roosevelt, Sheridan, Daniels, Dawson, Richland, Rosebud, and Carter counties (Skaar unpublished data, Montana Bird Distribution Committee 2012), but no details on these records are documented. 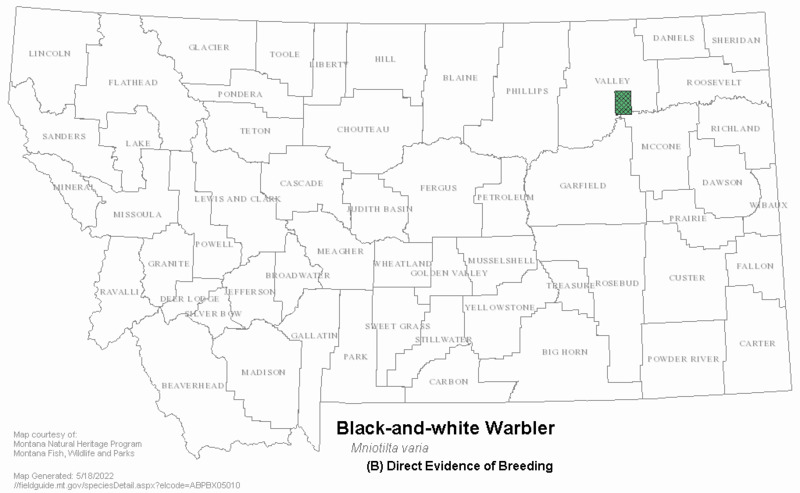 No other information is available on the reproductive habits of the Black-and-white Warbler in Montana. In general, breeding begins as early as mid-April at southern latitudes and as late as late July at northern latitudes. The female builds the cup-shaped nest of grasses, dry leaves, strips of inner bark, and pine needles lined with finer grasses, rootlets, hair or mosses (Terres 1980, Baicich and Harrison 1997). Clutch size is usually five, ranging from 4 to 6 eggs. Eggs are laid daily until the clutch is complete. Eggs are short, sub elliptical, and range in color from white or cream-white, sometimes pale bluish or greenish-white, with finely speckled pigments of brown, and occasionally lavender and pale lilac, encircling the larger end. Dimensions average 15.50 to 18.46 mm by 13.02 to 13.64 mm with average weights of 0.076 gram (Kricher 1995). Incubation, which requires 10 to 12 days, begins when the penultimate or last egg is laid and is conducted by the female only. When threatened, females may perform a distraction display described as the "rodent run," for its hunched posture and tail drag (Kricher 1995). The young are fed by both parents and leave the nest at 8 to 12 days post hatching. This species is single brooded, though double broods are suspected (Kricher 1995). In Arkansas, 73.7% of 19 nests were successful (fledged at least one young) (Martin 1993). Age at sexual maturity is unknown (Kricher 1995). 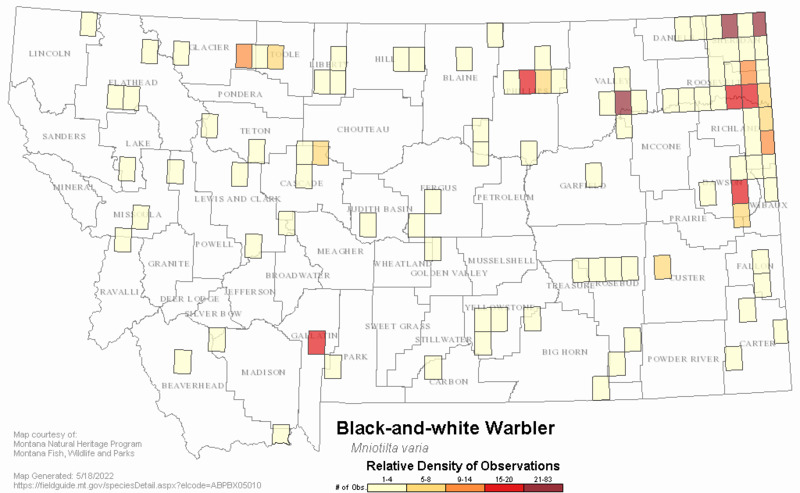 No management activities in Montana specific to the Black-and-white Warbler are documented. Arendt, W.J., and collaborators. 1992. Status of North American migrant landbirds in the Caribbean region: A summary. Pages 143-71 in J.M. Hagan III, and D.W. Johnston (editors). Ecology and conservation of neotropical migrant landbirds. Smithsonian Institute Press, Washington, D.C. xiii + 609 pp. Askins, R.A., D.N. Ewert, and R.L. Norton. 1992. Abundance of wintering migrants in fragmented and continuous forests in the U.S. Virgin Islands. Pages 197-206 IN Ecology and conservation of neotropical migrant landbirds (J. M. Hagan and D. W. Johnston, Eds.). Smithsonian Institution Press, Washington, D.C.
Baicich, P.J. and C.J.O. Harrison. 1997. A guide to the nests, eggs, and nestlings of North American birds. 2nd ed. Academic Press, San Diego. Bent, A.C. 1953. Life histories of North American wood warblers. U.S. Natl. Mus. Bull. 203. Washington, D.C.
Bushman, E.S., and G.D. Therres. 1988. Habitat management guidelines for forest interior breeding birds of coastal Maryland. Maryland Dept. Natural Resources, Wildlife Tech. Publ. 88-1. 50 pp. Clark, K., D. Euler, and E. Armstrong. 1983. Habitat asoociations of breeding birds in cottage and natural areas in central Ontario. Wilson Bull. 95: 77-96. Conner, R.N., J.G. Dickson, B.A. Locke, and C.A. Segelquist. 1983. Vegetation characteristics important to common songbirds in East Texas. Wilson Bulletin 95:349-361. Crawford, H.S., R.G. Hooper, and R.W. Titterington. 1981. Songbird population response to silvicultural practices in central Appalachian hardwoods. Journal of Wildlife Management 45:680-92. Ewert, D.N., and R.A. Askins. 1991. Flocking behavior of migratory warblers in winter in the Virgin Islands. Condor 93:864-868. Faaborg, J. and W.J. Arendt. 1984. Population sizes and philopatry of winter resident warblers in Puerto Rico. Journal of Field Ornithology 55:376-378. Gonzalez-Alonso, H., M.K. McNicholl, P.B. Hamel, M. Acosta, E. Godinez, J. Hernandez, D. Rodriguez, J.A. Jackson, C.M. Grego, R.D. McRae, and J. Sirois. 1992. A cooperative bird-banding project in Peninsula de Zapata, Cuba, 1988-1989. Pages 131-142 IN Ecology and conservation of neotropical migrant landbirds (J. M. Hagan and D. W. Johnston, Eds.). Smithsonian Institution Press, Washington, D.C.
Graber, J.W. and R.R. Graber. 1983. Feeding rates of warblers in spring. Condor 1985:139-150. Greenberg, R. 1992. Forest migrants in non-forest habitats on the Yucatan Peninsula. Pages 273-286 IN Ecology and conservation of neotropical migrant landbirds (J. M. Hagan and D. W. Johnston, Eds.). Smithsonian Institution Press, Washington, D.C.
Hutto, R.L. 1992. Habitat distribution of migratory landbird species in western Mexico. Pp. 221-239 in J. M. Hagan and D. W. Johnston, eds. Ecology and conservation of neotropical migrant landbirds. Smithsonian Institution Press, Washington, DC. Klimkiewicz, M. K., R. B. Clapp, and A. G. Futcher. 1983. Longevity records of North American birds: Remizidae through Parulinae. Journal of Field Ornithology 54:287-294. Lynch, J.F. 1989. Distribution of overwintering Nearctic migrants in the Yucatan Peninsula, I: general patterns of occurrence. Condor 91:515-544. Martin, T.E. 1993. Nest predation among vegetation layers and habitat types: revising the dogmas. American Naturalist 141:897-913. Morton, E.S. 1980. Adaptations to seasonal changes by migrant land birds in the Panama Canal zone. Pages 437-453 IN Migrant birds in the neotropics: ecology, distribution, and conservation (A. Keast and E. S. Morton, eds.). Smithsonian Institution Press, Washington, D.C. Noon, B.R., D.K. Dawson, D.B. Inkly, C.S. Robbins, and S.H. Anderson. 1980. Consistency in habitat preference of forest bird species. Transactions North American Wildlife Natural Resources Conference 45:226-244. Oberholser, H.C. 1974. The bird life of Texas. 2 volumes. University of Texas Press, Austin, Texas. Rappole, J.H., E.S. Morton, and M.A. Ramos. 1992. Density, philopatry, and population estimates for songbird migrants wintering in Veracruz. Pages 337-344 IN Ecology and conservation of neotropical migrant landbirds (J. M. Hagan and D. W. Johnston, Eds.). Smithsonian Institution Press, Washington, D.C.
Robbins, C.S., B.A. Dowell, D.K. Dawson, J.A. Colon, R. Estrada, A. Sutton, R. Sutton, and D. Weyer. 1992. Comparison of Neotropical migrant landbird poulations wintering in tropical forest, isolated forest fragments, and agricultural habitats. Pages 207-20 in J. M. Hagan III and D. W. Johnston (editors). Ecology and Conservation of Neotropical Migrant Landbirds. Smithsonian Institution Press, Washington, DC. Sodhi, N.S. and C.A. Paszkowski. 1997. The pairing success of male Black-and-White Warblers, (Mniotilta varia), in forest fragments and a continuous forest. Canadian Field-Naturalist 111:457-458. Terres, J. K. 1980. The Audubon Society encyclopedia of North American birds. A. A. Knopf, New York. Westworth, D.A. and E.S. Telfer. 1993. Summer and winter bird populations associated with five age-classes of aspen forest in Alberta. Canada Journal of Forestry Research 23:1830-1836. Wilson, C.W., R.E. Masters, and G.A. Bukenhofer. 1995. Breeding bird response to pine-grassland community restoration for red-cockaded woodpeckers. Journal of Wildlife Management 59:56-67. Blake, J. G., and B. Loiselle. 1992. Habitat use by neotropical migrants at La Selva Biological Station and Braulio Carrillo National Park, Costa Rica. Pages 257-72 in J. M. Hagan III and D. W. Johnston (editors). Ecology and Conservation of Neotropical Migrant Landbirds. Smithsonian Institution Press, Washington, D.C.
Casey, D. and D. Hein. 1983. Effects of heavy browsing on a bird community in deciduous forest. Journal of Wildlife Management 47:829-836. Chadwick, N. L., D. R. Progulske, and J. T. Finn. 1986. Effects of fuelwood cutting on birds in southern New England. Journal of Wildlife Management 50:398-405. Davis, W.E. Jr. 1989. Distraction display or ¿injury feigning¿ in birds. Bird Observer, 17:125-127. Dunn, J.L. and K.L. Garrett. 1997. A field guide to warblers of North America. Houghton and Mifflin Publ., Boston, Mass. x + 656 pp. Forman, R. T., A. E. Galli, and C. F. Leck. 1976. Forest size and avian diversity in New Jersy woodlots with some land use implications. Oecologia 26:1-8. Freedman, B., C. Beauchamp, I. A. McLaren, and S. I. Tingley. 1981. Forestry management practices and populations of breeding birds in a hardwood forest in Nova Scotia. Canadian Field-Naturalist 95:307-311. Galli, A. E., C. F. Leck, and R. T. T. Forman. 1976. Avian distribution patterns in forest islands of different sizes in central New Jersey. The Auk 93:356-64. Graber, J. W., R. R. Graber, and E. L. Kirk. 1983. Illinois birds: wood warblers. Biological Notes 118. Illinois Natural History Survey, Champaign, Illinois. James, D. A. and J. C. Neal. 1986. Arkansas Birds - Their Distribution and Abundance. The University of Arkansas Press, Fayetteville, Arkansas. James, F.C. 1971. Ordination of habitat relationships among breeding birds. Wilson Bull. 83: 215-236. Lemon, R.E., J. Struger, and M.J. Lechowicz. 1983. Song features as species discriminants in American wood-warblers (Parulidae). Condor 85: 308-322. O¿Shea, T. J., and T. A. Vaughan. 1999. Population changes in bats from central Arizona: 1972 and 1977. Southwestern Naturalist 44:495-500. Palmer-Ball, B.L., Jr. 1996. The Kentucky Breeding Bird Atlas. The University Press of Kentucky, Lexington. Pashley, D. N. 1988. Warblers of the West Indies. I. The Virgin Islands. Caribbean J. Sci. 24:11-22. Pashley, D. N. 1988. Warblers of the West Indies. II. The Western Caribbean. Caribbean J. Sci. 24:112-126. Pashley, D. N., and R. B. Hamilton. 1990. Warblers of the West Indies. III. The Lesser Antilles. Caribbean J. Sci. 26:75-97. Pearse, P. A., D. D. Peakall, and A. J. Erskine. 1976. Impact on forest birds of the 1975 spruce budworm spray operation in New Brunswick. Canadian Wildlife Service Progress Note 62. Peck, G.K., and R.D. James. 1983. Breeding birds of Ontario, nidology and distribution, volume 1: nonpasserines. Royal Ontario Museum, Toronto, Canada. Pyle, P.S., N.G. Howell, R.P. Yunick, and D.F. DeSante. 1987. Identification guide to North American passerines. Slate Creek Press, Bolinas, California. 273 pp. Raffaele, H. A. 1989. A guide to the birds of Puerto Rico and the Virgin Islands. Revised edition. Princeton Univ. Press. 220 pp. Reitsma, L.R., R.T. Holmes, and T.W. Sherry. 1990. Effects of removal of red squirrels, Tamiasciurus hudsonicus, and eastern chipmunks, Tamias striatus, on nest predation in a northern hardwood forest: an artificial nest experiment. Oikos 57:375-380. Rich, A. C., D. S. Dobkin, and L. J. Niles. 1994. Defining forest fragmentation by corridor width: the influence of narrow forest-dividing corridors on forest-nesting birds in southern New Jersey. Conser. Biol. 8:1109-21. Skaar, P.D. (1923-1983). Notes in the unpublished P.D. Skaar files; notebook 1 of 2. Housed at Montana Audubon, Helena, Montana. Strelke, W. K. and J. G. Dickson. 1980. Effect of forest clear-cut edge on breeding birds in east Texas. Journal of Wildlife Management 44:559-567. Thompson, F. R., III and D. E. Capen. 1988. Avian assemblages in seral stages of a Vermont forest. Journal of Wildlife Management 52:771-777. Thompson, F. R., III, W. D. Dijak, T. G. Kulowiec, and D. A. Hamilton. 1992. Breeding bird populations in Missouri ozark forests with and without clearcutting. Journal of Wildlife Management 56:23-30. Wilcove, D. S. 1988. Changes in the avifauna of the Great Smoky Mountains: 1947-1983. Wilson Bulletin 100:256-271. Yahner, R. H. 1986. Structure, seasonal dynamics, and habitat relationships of avian communities in small even-aged forest stands. Wilson Bulletin 98:61-82. Yahner, R. H. 1993. Effects of long-term forest clear-cutting on wintering and breeding birds. Wilson Bull. 105:239-255. 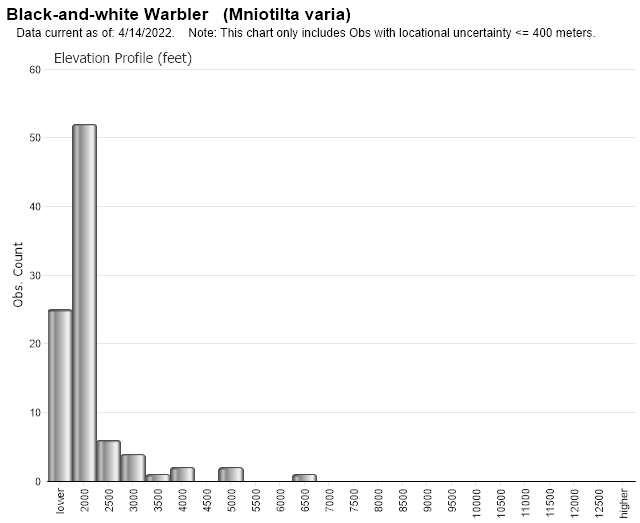 Web Search Engines for Articles on "Black-and-white Warbler"